Second Special offer...20% discount on all bookings up to the end of March 2019--- SPECIAL OFFER --- 3 and 4 day short breaks can be taken out of season at 75%/85% of the weekly rate. We now have FREE car parking available for one car only...PROVIDING that we are informed in advance by email the CAR REGISTRATION number and it is only on offer for bookings of at least one week. All prices are for up to 6 people. Special price for 4 people only using two bedrooms only. We are flexible about the Changeover day. We have an apartment on offer in Metropole Court located on the seventh floor above the renowned Hilton Metropole Hotel (called The Sunset Apartment) which is set on the seafront right in the centre of the City of Brighton and Hove. The apartment is a luxury FIVE Keys/Highly Commended graded penthouse balcony apartment with three bedrooms and two bathrooms - sleeping from 2 to 8 people. The views of the apartment from the sitting room and bedroom balconies(both in an Easterly and Westerly direction) are outstanding - mainly across the City and towards the sea. In the Metropole Hotel you have a ladies hairdressing salon, two restaurants, an indoor heated swimming pool and a luxury gym. Use of the gym and swimming pool costs £12 per person per day. There are two lifts to the 7th floor. I have been letting out holiday properties for many years and I am particularly proud to be able to offer The Sunset Apartment for short breaks of 3 Days(out of season) or for longer holidays. It is so central and convenient for all that Brighton has to offer. There is now FREE car parking available for one car only PROVIDING I am informed in advance by email the registration number of the car. but this only applies to bookings of at least one not on discounted bookings. The en-suite bathroom has just been refurbished with a fully tiled shower bath in along with a basin and wc. Car Parking is available in Regency Square just nearby at £2 per hour. Then again you can also park in Churchill Square Car Parks slightly further away from the apartment. FREE car parking for one car only PROVIDING that we are informed in advance of the registration number of that car. Only bookings of at least one week can take up this offer. FREE car parking for one car only is available PROVIDING that we are informed in advance of the registration number of that car. The wheelchair accessible facility means that as there are lifts to the apartment, there would be no problem reaching the apartment. However, it would not be possible to go up the stairs but on the ground floor of the apartment you have the twin bedroom which doubles up as a sitting room together with an en-suite bathroom. Strictly speaking the apartment does not have 'central heating' but in each room there is an individually controlled electric heater. There are two balconies - one the receives the morning sun and the other the afternoon and evening sun - (The sunsets from this balcony are glorious). There is seating both comfortable and dining for person 7 and 8. We all enjoyed our stay here very much. We were 6 people who stayed for 4 Nights, and we are all very pleased with the stay. The Apartment itself is big and nice and have 3 bedrooms, 3 bathrooms and a big dining table that was excellent when there were 6 of us. And it has a great view to the occean. The location is in the middle of Brighton, next to the seaside, so no need for taxis. We travel once a year, and this Apartment will be the one we will be trying to stay in next time. To summarize, a great Apartment in a great location. Perfect apartment for our stay over Christmas and new year - wanted for nothing. Excellent! This apartment and it’s location was perfect for our family gathering over Christmas and new year. We’re leaving with sadness as we had such a good time. Everything we needed was within walking distance: shops, theatre, restaurants, pubs - would recommend the Queensbury Arms! The apartment was well appointed, warm and comfortable with everything we needed supplied. It was a real plus to have a provided parking space in the hotel car park, although we didn’t use the car that much. The new ANPR system was a bit hit and miss but the hotel staff were obliging. We had family staying in the hotel too, so meeting up with them was easy. Booking, communication and access arrangements were seamless, with spare keys to make various comings and goings easy. It is rare that we stay in a property where our expectations are met so this one has a well deserved 5 stars. Thank you. Brighton – best holiday resort in the UK. And for complete freedom here is a fantastic apartment in which to stay. What a view! Watch the sea or the sunset (hence the name), or all over Brighton. The apartment is above the Metropole Hotel, should you want to avail yourself of the facilities. A great location: near the shops, near the restaurants or, should you want to cook for yourself, very good facilities. A stone’s throw from the beach, or a short walk to the Conference centre , the cinemas or the pier. Sky TV and a modem complete the scenario. Richard, the owner, just a phone call away if anything goes wrong. All you need then is the weather! Grand appartement en duplex avec magnifique vue sur la mer. Il peut accueillir 6 personnes aisément sans être à l'étroit. La situation est idéale. Nous avons adoré notre séjour et le recommandons vivement. Les quatre étoiles et non cinq sont pour l'installation sanitaire dont le débit d'eau est minimaliste. We would be very pleased to have the tenants/clients back again at any time. FREE car parking is now available for one car only providing that we are given in advance by email the registration number of the car. 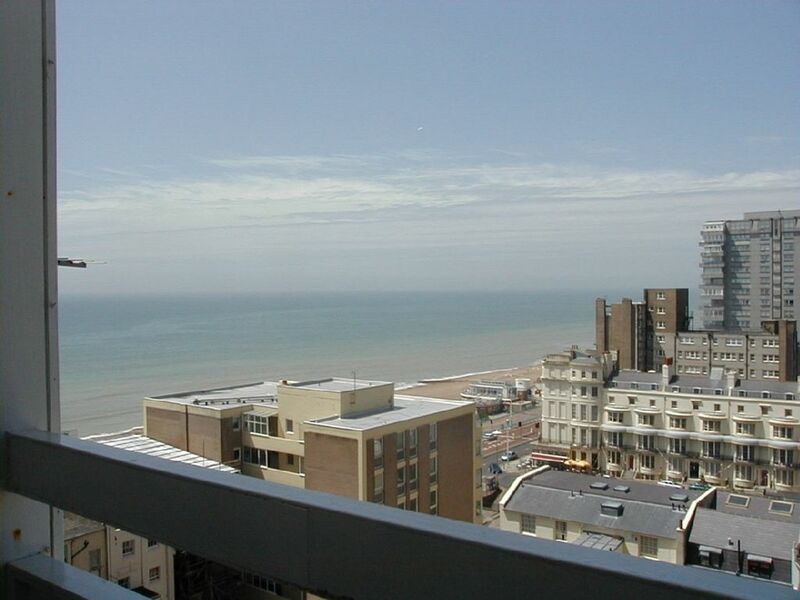 The apartment is very conveniently located right on the seafront in the centre of Brighton. Nearby is the Grand Hotel and also the Conference Centre along with the Churchill Square shopping mall and all the other main shops and stores that you would expect to find in a major city. There are regular bus services in both directions. Taxis are freely available all over the city. There is, of course, a great range of restaurants within a short walk of the apartment. Other than June/July and August and Christmas and New Year..
3 and 4 day short breaks may be taken and these cost 75% and 85% of the weekly rate. All prices are for up to 6 people but the flat will sleep up to 8 people. Other Activities: Many other leisure activities are available throughout Brighton and Hove. 3 and 4 day short breaks can be taken out of season at 75%/85% of the weekly rate. This applies in the Winter/Spring and Autumn but not in the months of June/July and August where the minimum booking period is ONE Week...This also applies to Christmas and New Year weeks.